Share your narcissistic selfies on a whole new level with Casio Exilim EX-FR10. Casio has announced a new modular camera Exilim EX-FR10 that designed with the controller and lens units can be separated to allow for take photos in almost any angle or distance. The Exilim EX-FR10 features a lens at the top part of the camera, and at the bottom it sports 2.0-inch 230K-dot LCD capacitive display that can be detached and also used as a remote shutter. It sports 14 megapixel f/2.3-inch CMOS sensor equipped with 21mm f/2.8 lens that can capture still shots as large as 4320×3240 and video recording maxes out at Full HD at 30 fps. Casio Exilim EX-FR10 also features WiFi connectivity so that users will be able to transfer photos wirelessly to other devices. With EX-FR10, users can use the controller to trigger the camera unit via Bluetooth which allows users to take photos from a distance, impossible angles, and incredible shots. Aside from that, EX-FR10 also comes with other interesting features, such as IPX6/IPX7 water proof and IP6X dust proof rating, mono-mic and speaker, offers +/-2EV exposure compensation, and an intervalometer to record files at user-defined periods. The camera measures 60.9×28.8mm and weighs 63g. 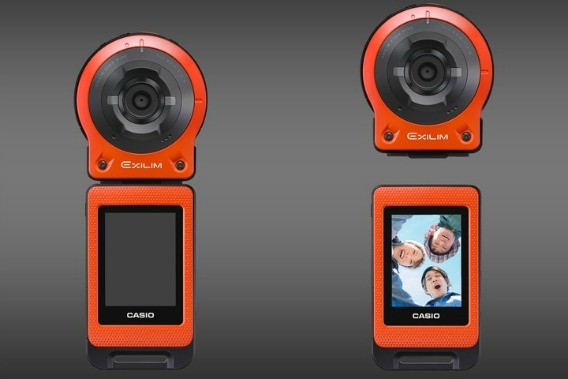 Casio EXILIM EX-FR10 will be available in red, green or white colours and set to go on sale starting September 12 with priced approximately $480.